With the incredible improvements in equipment in both audio and video recording, there are a very large number of folks out there undertaking their own media projects. The prices for these wonderful devices are at an all time low. You can literally set up a pro quality audio studio, unmatched by anything for any price only a few years ago, for a few thousand dollars. If you don't need more than eight tracks and will settle for CD quality, the price can literally be only a few hundred. Video has likewise improved both in price and capability. We'd like to share with you some of the aspects of the latest equipment available for these mediums. If you accept the premise that you as a musician would like others to hear and see you play, there are nearly unlimited options for you to make it happen. However with any technology, there always seems to be a few things left out that would make the experience optimally functional. For example most good dvCams have good sound capabilities, even with their internal mics. Still most will eventually want to use higher quality audio input, including remote condenser mics, and even audio signals from a mixer with full effects that can be simultaneously recorded with the video. Unfortunately most consumer and prosumer level dvCams have one common flaw and that is they use an auto level control. This means the sound, much like a VCR, is automatically monitored and a chip decides how much volume to apply to your input signal. While this works OK for pre-recorded sound like film sound tracks, it does not do an especially good job with live performances as the dynamic ranges in such a situation vary considerably - and suddenly. Also the mic inputs on most good video cameras are too sensitive for most good condenser mics. And, even if the mic will work pretty well as far as sensitivity, the audio chips and preamps in video cameras, even very expensive pro models, are not nearly of the quality of even moderately priced audio recording equipment. And the final hurdle is that in most cameras, the internal mic is not deactivated when using the line in inputs, so with live audio/video, using the mic input is necessary. Well we started looking around and after a lot of "gee, I don't knows", and other cluckings, found a company, BeachTek (www.beachtek.com), in Canada, that makes small mixing adaptors for nearly every video camera out there. Go to their website to find the right adaptor for your camera and local or online dealers who sell them. 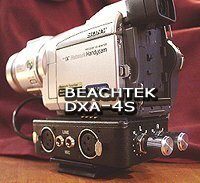 For our Sony cams, we use BeachTek's DXA-4S, and it has proved itself to be a very quiet and capable companion. It bolts right on to the camcorder bottom, while the bottom of the unit itself, in turn, bolts on to your tripod adaptor. A high quality short cable terminates with a stereo mini phone plug. The inputs are high quality balanced XLR's with the option of using a mono mini phone plug as well. This unit has mic/line switches that give you up to a 50db attenuation in signal and volume controls for each of the two channels that allow you to have complete control over the amount of signal level that reaches the mic input of the camera. This reduced signal allows the ALC (auto level control) chip to handle the input with greater clarity and much less noise. These adaptors also have a mono/stereo switch that does a noble job of summing the channels into a mono signal if desired, and even better, the thing is both passive (requiring no power) and close to dead quiet. Now your camera's audio chip will still produce some noise, especially if you reduce the input volume too much, or will distort if you drive the signal too aggressively, but when used properly, this unit suddenly gives you distinctly improved audio functionality to match the high quality video signals these cameras are capable of producing. As you can see in the photo at right, this is a very tidy little solution indeed to a major problem that is encountered by those who want live audio with their live video. If you watch news crews much, you will see such adaptors on even their high cost and larger professional full DVCAM and other broadcast quality video equipment. Even though these very costly $5- 80 K, cameras have auto level control overrides and pretty good internal audio mixing units with mic attenuation, many still use the adaptors as they are more flexible and have better signal to noise specs. You can use this adaptor to hook up your camera mic jack to a line level mixing output as well. The signal remains quiet and the ability to record your live performance with multiple instruments, including electric guitars and keyboards and effects simultaneously with your video, makes a really fun and extremely functional creative solution. The adaptors run a little under $200 and BeachTek makes them for nearly every camcorder with a mic input. We were amazed to find few, if any, other companies making such devices and applaud BeachTek for their quality and foresight. Even better, if you already have a good camera with firewire, the audio you send to your video editor can be stripped from the video and saved separately for mp3 compression. The following mp3 clip of one of Legend Guitars' lower priced, non-hand made D112SFTGT dreds follows. The sound was captured exactly as described above. With a good condenser mic plugged into the DXA, the video was shot with the lens cap on and the audio was subsequently stripped in the video editor and compressed as an mp3. The result was sweet, quiet, and was accurately representative of this unbelievably fine $1000 guitar. The DXA-4S is a one step solution for those with video cams who want to share their music on the web. A good mic (almost anything is better than internal camera mics), $90 Ulead Video 7 software and a firewire connection is all you need. 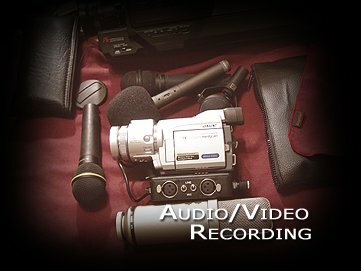 Obviously for bigger budget sound, audio recording is not done in the camera, but on high quality audio recorders and the subsequent two separate signals are mixed and matched using time coding later in the A/V studio. While this will give one optimum audio production quality, the software and sheer amount of equipment is an unanticipated addition for those who bought good mini dvCams or other quality formats with the hopes of simply producing some pretty nice A/V work. BeachTek was a real find and many of the early mp3 tracks you will hear at Fingerpick as well as all of the audio (with a few early exceptions), use the DXA-4S. There are many good DV and Digital8 consumer cams out there that will produce enviable results on a reasonable budget. Of course there are better solutions but they come with a pretty quickly increasing cost. Three CCD mini dvCams like the Sony 950 will give you a bit better color and depth but often don't quite match the resolution of the multi-mega pixel single CCDs. The Sony pro line starts at about two grand and goes up quicky to nearly 100K. A final word of advice. There are quite a number of places on the web that advertise very (suspiciously) low prices on digital video cameras. You will pay more for such products at professional companies like B&H Photo but in some cases it may be worth it. Many of the New York based discount camera dealers are really shady and there are many sad tales to be told from folks who have dealt with them. One that seems to be an anomaly is Butterfly Photo (www.butterflyphoto.com). Their prices are much better than B&H and their service is pretty good as long as you know what you want. We have had great luck with them. Discounts always come at a price and consumers should realize that price should not be the only criteria when deciding on a source for good quality equipment of any kind. Frankly, I have found Butterfly to be every bit as helpful as B&H, who have a bit of an "attitude" to say the least and Butterfly has much better pricing. There is a site that reviews customer experiences with the reputed nest of New York discount dealers and you would be wise to read their ratings before you spring for that "incredible" deal. The link to this consumer protection/evaluation site is as follows: http://www.resellerratings.com/ Check it out. It may save you a lot of hassles and, in the end, a lot of money as well. Sony, Panasonic, JVC and others all make good stuff. We prefer the Sony line as through the years we have yet to have a Sony product fail. Panasonic has been very reliable as well. Finally, you need to understand the differences in various modern video formats. We won't go into a long detailed piece here at this time, but simply put, there are several superior video formats available listed in increasing quality (and usually cost of equipment to acquire them) High8, Digital8, microDV, miniDV, and dvCAM. The final one in the list is the most professional of the group and does truly impressive uncompressed video. While true dvCAM gives one better video, the tapes are much more expensive, and you get less time per tape. The tracking heads are wider and provide better audio as well. The least expensive Sony we know of that is in this professional range is the DSRPDX10 shown at left. It has a 3CCD system, great resolution, and the little box on top, just below the mic, is a audio mixing interface with XLR inputs and a defeatable ALC, giving it great self-contained onboard sound flexibility. There are mic attenuators and other features that make this an incredibly good choice for those that have the nearly $2000 you can expect to pay from a reputable dealer. It is small enough to serve most video enthusiasts who don't like the idea of typical pro grade cameras 4 times its size (and ten times its price). Now the tried and true mini favorite of broadcasters and videographers alike has been the DSR-VX2000. This 3CCD camera has been used extensively for years for news and ad agency location shoots and has now been replaced by a new model, the DSR-VX2100. Both have 3 CCD systems as well (all 3CCDs have one for each color Red, Green, Blue - RGB) and though their pixel resolution per CCD is not as high as some of the less expensive single CCD miniDVs, (these babies cost nearly $3000) their onboard video processing chip is far better with the result being near broadcast quality video on a miniDV. The DSRPDX10 will handle both mini and full DVCAM, as well as true (not interpolated) widescreen 16:9 formats. This along with its audio capabilities has sold us on it as our next camera. We have used it and it is phenomenal, especially considering the next step up is nearly triple the price. And it is still less expensive than the venerable but mini-DV only DSR-VX2100 shown above right. But let's be sensible for a moment and admit that both of these cameras are way overkill for any web intended video. These cameras are for those who want to produce pro quality broadcast and DVD media, unless of course, you simply like having the best you can afford. And don't we all? The field of audio recording systems has evolved so quickly over the last few years, many find it difficult to make a clear decision on which way to go, including how much to spend. Our recommendation is that you FIRST decide what you want to do with audio and try to extrapolate how that may evolve in the future. Used, outdated recording junk is worth little so you need to look at least 5 years in the future as to your realistic intentions. I realize that this may be hard with current tendencies for entirely new technologies to arrive sooner than that. But consider, CDs have been around for fifteen years or so, and it is likely they will remain the predominant media for music acquisition for some time to come. Even if DVD becomes the format of choice, the quality of your recordings created with reasonably priced, currently existing equipment, should be more than good enough for that time span. The real question remains what you intend to do with your music. Do you want to simply archive, share it with friends, burn an occasional CD or stream it on the web? Are you going to be recording others for a fee, or is this a personal venture only? Spending thousands of dollars on a recording system so you can share you musical work on the web is, to be blunt, not logical. And with these higher price tag systems comes steeper learning curves as well. Yet many folks do just that with the latest state of the art recording equipment only to compress all of the advantages out of the final work in order to get it to stream efficiently on the Internet. Sharing music on the web is a great opportunity to test the waters as to the salability of your work. But like demo recordings, music labels and prospective customers understand that it is the song, talent and performance that is important, not the ultimate recording quality. They know if a work has potential, it can be re-recorded with state of the art facilities and perhaps even better performers. Nonetheless, there are great systems out there that are very low cost and will sound absolutely wonderful at web streaming bandwidths and even burned to a CD. Probably as good as most commercial recordings. Above we discussed the use of the DXA-4S from BeachTek as a way to get your sound into MP3 format. You need the camcorder and a little software, but if you have that it may be all you need to get your music heard quite nicely by friends and online A&R companies like TAXI (www.taxi.com). However, you may not want the additional baggage of video (and the relative fragility of video cameras). You also may not like the idea of putting better, higher drain audio capture cards in your computer that you do many other tasks on. I sure don't. A music PC to be effective and reliable is usually best left to audio recording only. However, there are solutions out there that will amaze you with their flexibility, quality, and low cost. 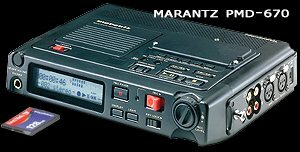 One of my favorites is the PMD 670 from Marantz. This little box, about the size of a DAT portable (or a very, very small notebook computer) has high quality balanced XLR inputs and a full range of controls from limiters to mic attenuators, accepts line level signals as well, and records on Compact Flash Media. This unit will record in every format from low to high quality MP3s, mpgs, to fully uncompressed PCM wave files. Its specs exceed DAT decks costing many times as much and it is simple to use and dead quiet. The recordings you can make on this stereo unit are impressive to say the least even in the MP3 format. With its USB connection you can plug it into your computer, (which sees it as simply another hard drive) and immediately post/share your files or burn a CD. The PMD runs on AA batteries, or a rechargeable battery pack as well as on an included AC adaptor. Typically 8 AA alkalines last at least 6 hours of continuous recording and several days in the field with typical recording procedures where the machine is off more than on. Even better, a 512mb Flash media card will hold 3.5 hours of pristine 320 kbps mp3 stereo heaven and about 45 minutes of studio ready 48Khz uncompressed PCM (.wav). It also has digital S/PDIF in and out, and frankly all it doesn't do is multitrack. But for location sound, sampling, or to get a sensational rendering of your musical performance out to the public quickly, we have not found its equal anywhere near its $700US price. So for those of you who are looking for a recording solution to get your guitar playing on the web to share with your forum buddies, this one is a no brainer. It also has high quality line in/out RCA jacks that accept silently the output of your mixer, which makes it ideal for a more finished sound with effects, multiple instruments, keyboards, and yes, even your electric guitar. Few people we know can tell the difference between a 320 Kbps mp3 and a CD recording. We recorded some CDs on to this thing when it first arrived and I will tell you the MP3 quality is amazing. It will also record much more highly compressed MP3s giving you 8 + hours of recording at 128Kbhs which still sounds extremely sweet and are more than good enough for web work. It comes with a 64MB flash card, but we recommend the 512MB (around $90 on sale). The attenuators give you a flat 0 to -20 db pad and its limiter is noiseless and very effective if you chose to use it. Also included are both bass only and bass/treble roll off switches (never needed them) and switchable +48v phantom power for those condenser mics that need it. And having no moving parts, it should last literally forever. Full size 1/4" headphone jacks that are as sweet as you will hear at any price. I use this thing as the audio recorder for my DVCAMS as well and sync the sound later in my editing programs when doing higher than web quality work. I recorded a rainstorm last week, using a stereo field mic I will discuss below for use in a music sound track in ProTools and the results were so life-like that every time I listen to this cut, I continue to get the uncontrollable urge to pee. Sweetwater (www.sweetwater.com) has this unit in stock (call Brian Loney at 800-222-4700 ext 1310) and though it might be nice to keep this one a secret and let people figure out how I get the quality location sounds I do, I could not resist sharing its existence with our readers. I too often see folks on forums agonizing over ways to get their guitar playing into their computer and out on the web, contemplating the IRQ and compatibility madness of audio capture cards and software that is designed for far more duty than they intend to use. This is an incredibly simple and robust solution for them as well as for the pro looking for great location portable recording capability. I'm heading to Vegas next month for a show and then Arizona for the end of Spring Training after which, my guitars, mics, cameras, and my PMD-670 will be heading for the mesas of Sedona for some environmentally soothing outdoor writing and recording. Nothing like a full yellow moon on top of a red rock mesa to inspire one musically. Well . . . yes the above recorder and a transparent, quiet and rugged stereo field mike that is not so expensive to cause heart failure if broken with a great pair of cans (headphones) is pretty much heaven for those like me who sometimes feel more creative outside the formality of even my own studio. ProTools is great and all the whizbang gadgets that make sound come alive are there waiting for me, but sometimes my creative energy needs a drive in a fast sports car on a mountain road with a quiet private spot at journey's end to put my inspiration into the digital world. The system shown above will do all I need in such situations. The microphone is a stereo Audio-Technica 822 condenser which you will be hearing a lot from in this magazine. I have better mics I suppose, large tube condensers that weigh as much as an old Martin 00 and cost as much as a good used car, but this mic is special. The more expensive 825 (we A/B'd two of each before buying) has better frequency specs, costs about a hundred more, and is intended for studio work. However, the higher frequency response/sensitivity actually caused the 825 to exhibit more self-noise. The difference between 20-20khz and 20-21khz for some reason allowed for more high end pollution in the 825 than the 822. Our 822 is dead quiet, at least to the degree that the content it provides has no discernable sound that degrades its use in even high end mixes. It uses a single AA battery and thus needs no phantom power. The battery lasts about a thousand hours but we have yet to wear one out (we trun it off when not in use). It has a low cut filter if needed for close miking but at one foot from a guitar, is dead quiet in the studio and picks up crickets, water and wind with no "pop/blast" if you are outside and want the extra ambience. We use this with our dvCams and the DXA-4S Beachtek adaptor initially for some of the web video recordings in this magazine as well as for some of the MP3s. (Obviously, now we use the PMD-670 as its audio chip is far superior to anything we found in cameras, even in the high 5 figure range). It comes with both a 1/8" stereo mini phone plug for direct hookup to the camera hot shoe as well as a 3+meter stereo cable terminated in two 1/4 balanced phone jacks which we put high grade balanced XLR adaptors on for everything. Mixers, adaptors, recorders - all like the XLR connection better. The stereo field properties of this mic is breathtaking in its presence. To say the sound is realistic is an understatement. We looked at two other stereo mics, one at $500 (Rode - we love Rode products) and one at $7500 (a Manley) and honestly could not justify their price for remote web content. Of course these two higher priced mics are outstanding for studio recording, but at around $250, the 822 should satisfy even very picky recordists although, again and especially, the $7500 Manley Gold Reference knocked our socks off. However, the idea of taking a mic that expensive out of the studio was idiotic. The headphones shown above, at the top of this section, that complete the portable studio are the Sony MDR-7509. Though the less expensive MDR 7506 are more popular and less expensive, I like the added bottom and top end response of the '09s as they more accurately reflect real world quality speaker systems. They are sweet and rugged are very isolating and yet very airy. I have several of each as well as a couple of the older V-600s and two pairs of the Senn 280 Pros which shut out as much outside sound as good shooter's headphones. I still prefer the '09s for serious headphone monitoring unless I am at the pistol range. The point is, just as good speakers are the most important part of any sound system, good headphones will make your listening far more enjoyable and better match your final amplified speaker sound which is always the final test. 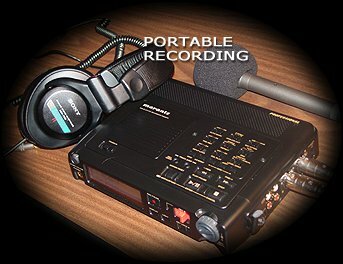 Now since the above was written we have converted to using the PMD-670 for a lot of our remote sessions. However, when we know clean power is going to be available and when we want to provide a finished product with reverb and other ambient enhancments our favorite "rack" system is the one shown at left. 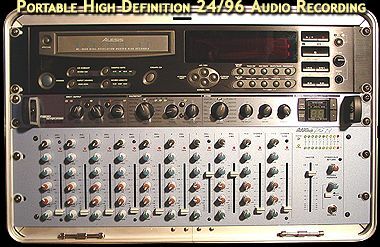 Instead of the PMD-670 we use the rack mountable Alesis Masterlink 9600 High Rsolution Hard Disk Mastering Recorder. This 40 Gig hard drive wonder records effortlessly at 24/96 giving you about 20 hours of time and does so with absolutely no latency or artifacting. 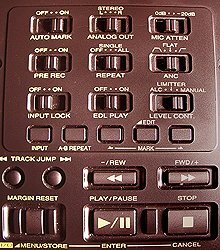 It is used in the film industry a lot and is the mastering deck of choice of many top end studios. At about a $1000 street price there is simply no finer solution we have found to capture high end two track sound. It has a built in cd burner and will not only make your cd's for you (remember cd quality is always 16bit / 44.1 Khz) ut will allow you to archive at 24/96 onto cd and then get them into your final DAW computer based or otherwise. It has a host of real world functions that make it the best deal on the planet. S/PDIF, RCA and other connections are all provided and in the rack it is a silent mighty partner.